Those who are tainted, unrestrained and devoid of truthfulness do not deserve the robe. While residing at the Jetavana Monastery in Savatthi, the Buddha spoke these verses, with reference to Devadatta. 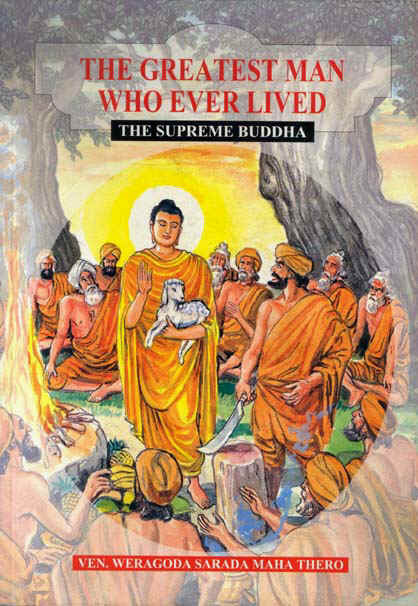 For on a certain occasion the two Chief Disciple, each with s retinue of five hundred monks, took leave of the Buddha and went from Jetvana to Rajagaha. The residents of Rajagaha united in twos and threes and in larger groups gave alms in accordance with the custom of giving alms to visitors. Now one day Venreable Sariputta said, in making the Address of Thanksgiving, "Lay berthren, one man himself gives alms, but does not urge another to give; that man receives in future births the blessing of wealth, but not the blessing of a retinue. Another man urges his neighbour to give, but does not himself give; that man receives in future births the blessing of a retinue, but not the blessing of wealth. Another man neither himself gives alms nor urges others to give; in future births that man receives not so much as a bellyful of sour rice-gruel, but is forlorn and destitute. Yet another both himself gives alms and urges his neighbour to give; that man, in future births in a hundred states of existence, in a thousand states of existence, receives both the blessing of wealth and the blessing of a retinue." 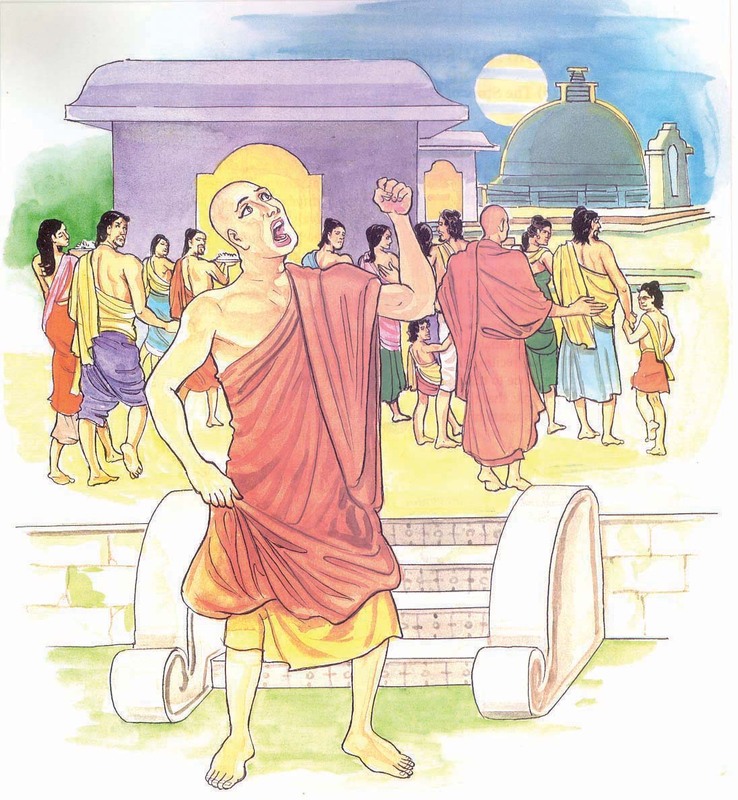 Thus did Venerable Sariputta preach the law. One person invited the Venerable to take a meal with him, saying," Venerable, accept my hospitality for tomorrow." For the alms-giving someone handed over a piece of cloth, worth one hundred thousand, to the organizers of the alms giving ceremony. He instructed them to dispose of it and use the proceeds for the ceremony should there be any shortage of funds, or if there were no such shortage, to offer it to anyone of the monks they thought fit. It so happened that there was no shortage of anything and the cloth was to be offered to one of the monks. Since the two Chief Disciples visited Rajagaha only occasionally, the cloth was offered to Devadatta, who was a permanent resident of Rajagaha. It came about this way, Some said," Let us give it to the Venerable Sariputta." Others said. " The Venerable Sariputta has a way of coming and going. But Devadatta is our constant companion, both on festival days and on ordinary days, and is ever ready like a water-pot. Let us give it to him." After a long discussion it was decided by a majority of four to five the robe to Devadatta. So they gave the robe to Devadatta. Devadatta cut it in two, fashioned it, dyed it, put one part on as an undergarment and the other as an upper garment, and wore it as he walked about. When they saw him wearing his new robe, they said, "This robe does not befit Devadatta, but does befit the Venerable Sariputta. Devadatta is going about wearing under and upper garment which do not befit him." 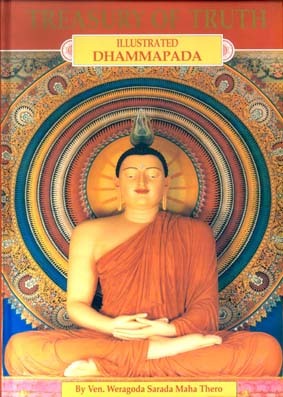 Said Buddha, "Monks, this is not the first time Devadatta has worn robes unbecoming to him; in a previous state of existence also he wore robes which did not befit him." So saying, he related the following. Once upon a time, when Bramadatta rules at Benares, there dwelt at Benares a certain elephant hunter who made a living by killing elephants. Now in a certain forest several thousand elephants found pasture. One day, when they went to the forest, they saw some Private Buddhas. From that day, both going and coming they fell down on their knees before the Private Buddha before proceeding on their way. 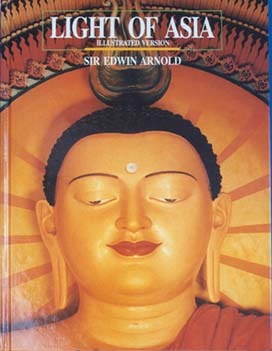 A monk may be stained with defilements, bereft of self-control and awareness of reality. Such a monk, though he may wear the 'stained cloth' (the monk's robe which has been specially coloured with dye obtain from wild plants), he is not worthy of such a saintly grab.